United States players are welcome to play at Cherry Jackpot Casino! WHY? : Licensed and regulated, one of the highest welcoming bonuses for an online casino, download, insta-play or desktop play, bitcoin ready. United States players as well as North & South American and Asian players. Not recommended for EU players as most countries are restricted. Cherry Jackpot is another top brand owned and operated by ESG N.V., a company that specialised in running online casino sites. For this brand, ESG has elected to combine the retro symbolism of the iconic cherry symbols and the everlasting allure of hitting a jackpot. Beyond these early impressions, there are many more facets to Cherry Jackpot. Cherry Jackpot makes the showcasing of the welcome offer, latest games, and key site features the priority. It’s true that the main design could be stronger, but Cherry Jackpot has at least focused on creating a gaming site with a solid structure. This shall leave you free to start gaming, handling cash matters, and going about your business. Cherry Jackpot has an incredible welcome offer that extends long after your first deposit. In fact, you can keep claiming the offer over 10 deposits. It’s going to be quite some time before you need to claim any other deal, and that can only be a good thing. On each of your first 10 deposits, you are eligible to receive a 200% bonus of up to $2,000 apiece. All in all, this could lead to you playing with up to $20,000 extra. Of course, you can stick to much lower levels, and Cherry Jackpot can accept deposits of $30 or higher (on select methods). You are also advised to read Cherry Jackpot’s bonus terms and conditions. That is because these reveal that 40x play-through requirements have to be met prior to withdrawal. Moreover, you cannot play baccarat, craps, roulette, sic bo, or war to clear requirements. Lastly, you must remember to use “CHERRY200” coupon code for every deposit bonus. Minimum deposit: $30 with Bitcoin; $35 with alternative methods. Deposit methods: Bitcoin; MasterCard; Neteller; Skrill; VISA; ecoPayz. Withdrawal methods: Bitcoin; Bank Wire; Cheque; Neteller; Skrill; VISA; ecoPayz. *Any legitimate wins over the mentioned limits can be negotiated for a faster payout. Restricted Countries: Austria, Italy, Belgium, Latvia, Bulgaria, Lithuania, Croatia, Luxembourg, Cyprus, Malta, Czech Republic, Netherlands, Denmark, Poland, Estonia, Portugal, Finland, Romania, France, Slovakia, Germany, Slovenia, Greece, Spain, Hungary, Sweden, Ireland, United Kingdom. A major finding of this review is the fact that Cherry Jackpot has an instantly playable mobile casino site that is responsive to some major operating systems. For starters, you have got Android to consider if your tablet or smartphone is from Samsung, HTC, Sony, Google, or another top manufacturer. In addition, you can play on iPhone or iPad. Desktop users are also given the opportunity for instant access if they choose to play on a device that is powered either by Apple or Windows. In the case of the latter, however, it is also possible to install the Cherry Jackpot desktop casino software. This can only be installed on Windows and offers ultra-stable performance. 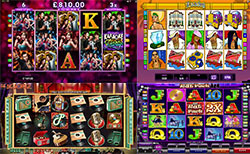 Cherry Jackpot operates with a lone software provider in the form of Realtime Gaming (RTG). In a best-case scenario, a casino site should be working with more than one software specialist. Fortunately, this isn’t so bad for Cherry Jackpot, as RTG casino games are not overly common. Basically, this means that the games should be fresh for most players. One of the most helpful aspects of the casino library is that you can click on the new games tab to see what is just coming out. • Slots: Eagle Shadow Fist, Dragon Orb, Fantasy Mission Force, and Kung Fu Rooster are just some of the slot title to try. • Progressives: Aztec’s Millions, Megasaur, and Aztec’s Millions join Caribbean hold’em, Caribbean stud, and let’em ride. • Tables: pai gow poker, three-card rummy, baccarat, pontoon, and blackjack are all playable at Cherry Jackpot. • Speciality: go to this category if you want to play European or American roulette. Also included here are keno and craps. • Video poker: this strong selection is headlined by jacks or better, deuces wild, joker poker, and aces & eights. Cherry Jackpot goes to exception lengths when trying to provide on-going perks to registered players. After using up all of the sign up bonuses, you can start consulting the everyday schedule of offers. Not a day goes buy when you will be unable to add complimentary spins or bonus credit to your Cherry Jackpot account. There is a welcome spread of bonus types, with Cherry Jackpot giving out no deposit deals quite often. Alternatively, you can make deposits in order to receive larger sums of funds. As advice, always make sure to use up one offer before claiming another, and remember to submit promo codes where necessary. At Cherry Jackpot, you can go to the bottom and see a whole host of detailed information pages. In no particular order, these include security, privacy, fair gaming, responsible gaming, banking, terms & conditions, about, contact, and frequently asked questions, which is great for providing the most common answers to issues. You will also have the luxury of being able to initiate direct communication. Cherry Jackpot has a toll-free US number that can be reached, while the online methods include email and live chat. In most cases, live chat should be the best solution, as Cherry Jackpot promises on the site that there is 24-hour support on every day of the week. Cherry Jackpot is wholly up front in communicating the standard of its security software. This must never be overlooked, as it fundamentally determines the prevention of cyber criminals from intercepting financial data. This is major, as depositing and withdrawing are two fundamental acts when playing with online casinos. In this instance, Cherry Jackpot uses secure sockets layer (SSL) encryption that is graded at 128-bit. Throughout the industry, SSL is recognised as the ultimate form of encryption that is currently used. In short, you don’t want to accept anything less than 128-bit encryption. To ensure the validity of each registered player Cherry Jackpot Casino as all legitimate casinos requires verification process. Cherry Jackpot doesn’t wow with its visual branding, but the bones of this site are extremely strong. In fact, it’s very reassuring to encounter a casino site that is so upfront in the sharing of information and details. This really backs up Cherry Jackpot’s strongest aspects, such as the mobile compatibility, financial security, welcome bonuses, and long-term rewards.